Nintendo has a history of being the non-traditional, quirky member of the gaming community. Instead of releasing an ultra-powerful console meets PC – like Sony and Microsoft – the company released a device that blurred the lines between being a stay at home console and a portable gaming device. 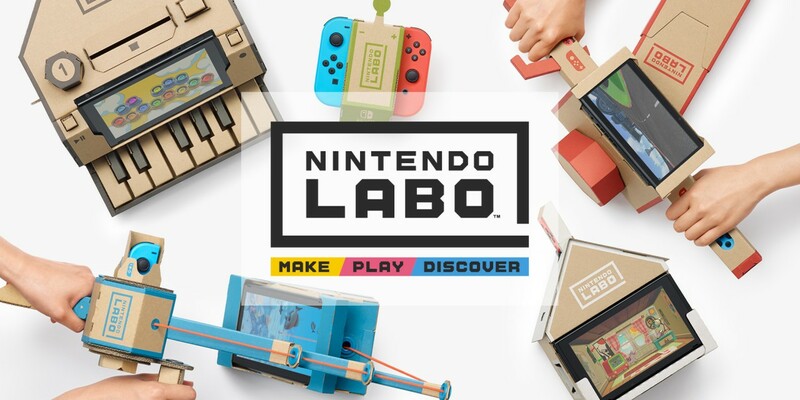 Today, Nintendo is continuing their non-traditional streak by introducing Nintendo Labo, a new line of interactive make, play and discover experiences designed to inspire creative minds and playful hearts alike. Utilising the Nintendo Switch console, the Nintendo Labo kits provide the tools and technology to make fun DIY creations, play games with your creations, and discover how Nintendo Switch technology shapes ideas into reality. With each Nintendo Labo kit, inspired minds across all generations can transform modular sheets of cardboard – specially designed to interact with the Nintendo Switch console and Joy-Con controllers – into interactive creations called Toy-Con. From a piano to a motorbike, a robot and more, each Toy-Con comes to life when combined with the Nintendo Switch in different ways. As you make, you will have fun discovering how the technology works and even invent new ways to play with each Toy-Con. For example, you can make a functioning 13-key piano that brings your musical arrangements to life once the Nintendo Switch console and Right Joy-Con controller are inserted. As you play, the IR Motion Camera in the Right Joy-Con detects which keys are pressed and plays each note through the console’s built-in speakers. Budding musicians can also experiment with their own musical creations. Or, you can take control of your very own motorbike by constructing a functioning set of handlebars, with a Joy-Con inserted in each side and the Nintendo Switch console cradled in the middle. Simply hit the ignition button, turn the right handle to engage the accelerator, and watch your adventure unfold on the Nintendo Switch screen, as you race to new destinations. With Nintendo Labo, making and discovering is just as much fun as playing. Every Toy-Con creation presents exciting challenges and varying degrees of complexity, so each one is a unique experience. Making Toy-Con is especially fun with family and friends, as you collaborate and share each other’s Nintendo Labo experiences. Once built, those with a creative touch can customise their Toy-Con creations with their own colouring pens, stickers and paint to give them a personal feel – the only limit is their imagination. A special Customisation Set that includes fun stencils, stickers and coloured tape will also be available to purchase from 27th April. 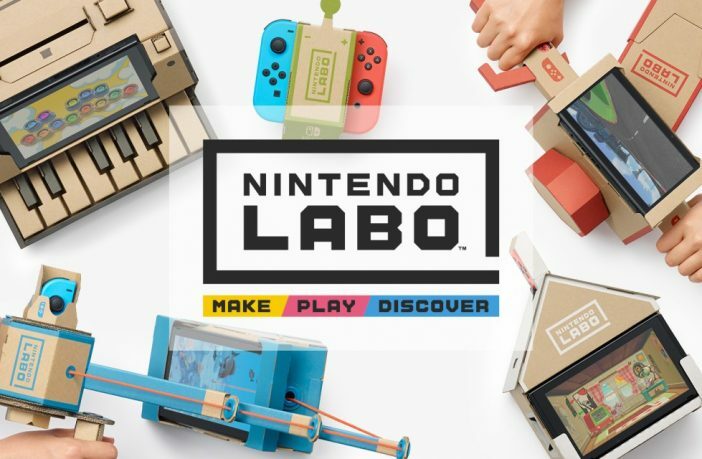 Nintendo Labo launches on 27th April with two kits: the Variety Kit and the Robot Kit. Both kits include everything you need to bring your Toy-Con to life, including the building materials and relevant Nintendo Switch software. With the Variety Kit, you can create many different Toy-Con, including Toy-Con RC Car, Toy-Con Fishing Rod, Toy-Con House, Toy-Con Motorbike and Toy-Con Piano. Toy-Con RC Car: Insert the Left and Right Joy-Con into your newly built RC Car and control its movement using touch screen controls on the Nintendo Switch. The HD rumble feature in the Joy-Con controllers will cause vibrations that move the car in the direction you choose. Materials to construct two RC Cars are included. Toy-Con Fishing Rod: Construct the Fishing Rod with an active, rotating reel that is attached by string to a cradle holding the Nintendo Switch console. Catch one of many exotic fish shown swimming on the Nintendo Switch screen by casting your Fishing Rod and unwinding the reel to lower the hook. Once you feel a vibration from the Joy-Con inserted in the reel, you must crank the reel quickly and tug the Fishing Rod upwards to try and complete the catch. Toy-Con House: By inserting various assembled blocks into openings in the sides and bottom of the House, you can interact, feed and play games with a cute creature on the front-facing Nintendo Switch screen. Each differently shaped block is detected by the IR Motion Camera on the Right Joy-Con inserted on top of the House. Toy-Con Motorbike: Insert each Joy-Con into an assembled set of handlebars to drive a motorbike on the Nintendo Switch screen. Pressing the ignition button starts the engine, twisting the right handle activates the throttle, and leaning your body or turning the handlebars left and right controls the motorbike. Toy-Con Piano: After assembling a beautifully crafted 13-key piano and inserting the Nintendo Switch console and Joy-Con, you can create your own music by pressing different keys. You can even insert different assembled knobs to create new sound effects and tones. Toy-Con Robot: Create a wearable robot suit, and insert the Left and Right Joy-Con into the designated slots on the backpack and visor to assume control of the robot, which is shown on the TV when the Nintendo Switch console is docked. Enjoy a variety of fun game-play experiences, including Robot mode, where you can destroy in-game buildings and UFOs.